Today was my first "Sun Mum" class at Surf Dubai. This is exactly my kind of work out! I loved it. If you are looking for a fun work out, with a challenging experience while working on your tan, here you go, don't look any further. 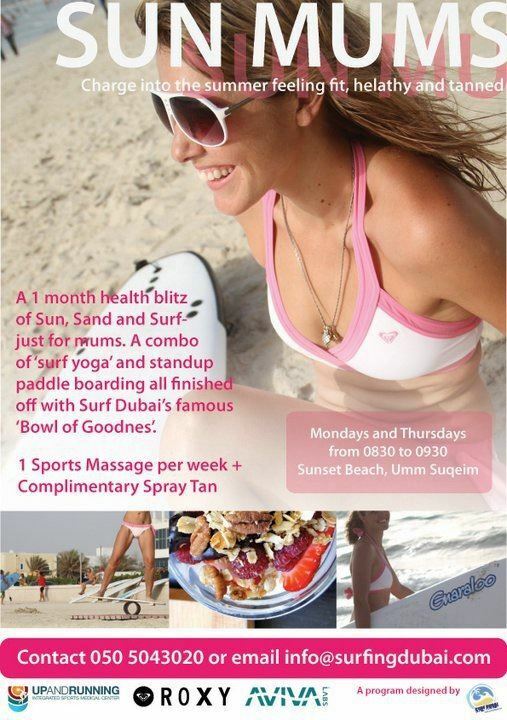 "Sun Mum" is a 4 weeks programme (1 hour session per week), based on a combo of "surf yoga" and stand up paddle. This unique workout will get you fit! It promotes balance and strength with a focus on core muscle. At 8.30, a group of ten mummies gathered together at Sunset Beach, Umm Suqeim ready to experience the "surfer life style". We started with quick warm up, followed by some invigorating yoga moves based on surf technique with the beautiful beach as a back drop. Then after some instructions and directions from the instructors we got to the water with our gear... A board and a paddle. The paddle board is like an enlarged regular surfboard (making it is much easier to stand up on) and using the paddle you propel yourself across the surface of the water. Not easy at first, it quickly become a very enjoyable work out experience. We all finished off the session around coffee, a healthy bowl muesli and a good laugh. Thank you Scott and Dani for making our Monday mornings so bright and healthy. Visit Surf Dubai for more info on Surfing and Stand Up Paddling classes. What a fantastic idea! They have loads of nice ideas like this here in Guildford, but sadly, I have no one to leave the kids in order to take part :-( It's nice in Dubai everyone has maids to babysit so the mommies can get out there and get back into shape. Enjoy it as much as you can!!!! Just saw the website! When you wrote Scott, I didn't realize you meant Scott Chambers! I'm so impressed! WOW! I was also very impressed and so happy for Scott. He has set up a very successful business. Surf Dubai is doing so well.